The first "FAT TUESDAY" Mardi Gras street party happens in 2015. In previous years, Breckenridge held a parade, but on Feb 17, 2015 the movement will come down off the trucks and take over Main Street. 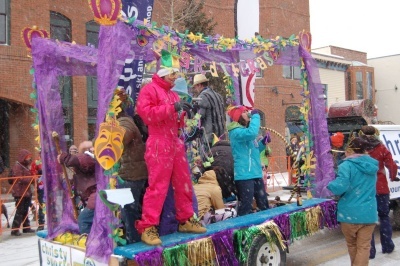 This event will become an annual occurrence since it is well known that Mardi Gras lovers and beaucoup visitors from New Orleans take over Breckenridge with masks, boas, beads, music and revelry to celebrate the carnival season. The free Mardi Gras Street Party happens in the 100 & 200 blocks of South Main Street from 2 to 5 p.m. and you can anticipate more every Tuesday before Ash Wednesday, the beginning of Lent. Look forward!